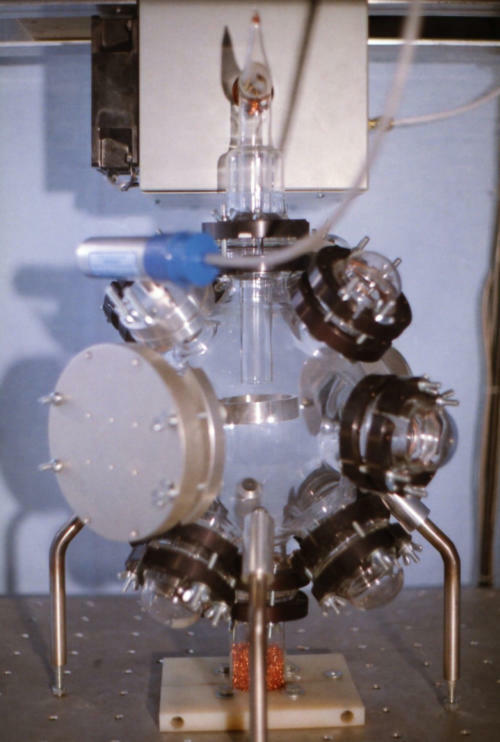 Options Flux Oil Free Pump AO Exposure Chamber AO Density Profiler VUV Solar Simulator Single VUV-UV Source RF Oxygen Power (W) • Complete system, including pump, mounted in standard 47.5 cm (19 in) rack • Standard system is in full-height 1.8 m (72 in) rack • Budget system is mounted in half height rack • In-Situ Atom and Molecule Absorption and Fluorescence Measuring Systems • OAMS and NAMS Oxygen Absorption and Nitrogen Atom Measuring Systems • Profiling Systems - Irradiance, Atomic Oxygen Density and Atomic Nitrogen Density Profilers Subsystems and Options Each subsystem can be purchased as a part of a complete ATOMS system or as a product on its own. Atomic Oxygen Exposure Chamber (AO-EC) • Pyrex vacuum chamber • Quick dismount 5 cm diameter circular specimen holder • Gas inlet manifold • Outlet pumping manifold with ozone filter & throttle valve • Multiple ports for extra sample holders, RGA, Atomic Oxygen Density Profiler, VUV-UV Solar Simulator • Dual Thermocouple gauges for pump & system pressure VUV-UV Solar Simulator (VUV-UV-SS) • 3 VUV-UV sources covering 115-400 NM • Irradiates sample with > one solar equivalent of VUV and near UV light • CF Mounting Flange with Lamp Adapter (3 sets) • Lamps included are: o Krypton Continuum Source (KrCM-L) o Xenon Continuum Source (XeCM-L) o Xenon Flashlamp (XeCQ-LF) In-Situ System • Two models of in-situ system (measure atomic or molecular density through different means): o In-Situ Atom and Molecule Absorption Measuring Systems o In-Situ Atom and Molecule Fluorescence Measuring Systems • Species determined by the type of lamp and detector used • Species include atomic Oxygen, Nitrogen, Chlorine and Hydrogen as well as molecular OH, NO and CO • Detection limits of: o 109 atoms or 1012 molecules per cm3 for a 10 cm path with the Absorption Measuring System o 106 atoms or 109 molecules per cm3 for a 10 cm path with the Fluorescence Measuring System • Both systems are “plug-and-run” and include everything required to make measurements Density Profiling System • For atomic Oxygen or atomic Nitrogen profiling • Measures irradiance across sample • Has four detectors covering 110 - 1000 nm Features of the Atomic Oxygen Exposure and Measurement System SIMULATES LOW EARTH ORBIT: Samples exposed to continuous stream of thermal oxygen atoms. HIGH FLUX: Atomic oxygen flux of 2x10^19 cm^2/sec (up to 2x10^16cm^2/sec equivalent 5 eV atomic oxygen flux measured with Kapton dosimeter). QUICK TURN-AROUND: Measurable erosion of Kapton in 1/2 hour. Typical sample exposure time is 2 hours. 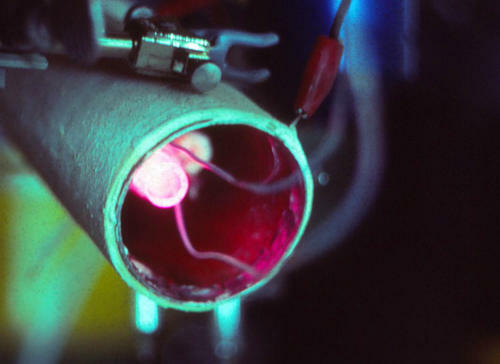 NO INTERFERENTS: Samples are downstream from active plasma and are not exposed to uncontrolled ions, metastables or UV radiation as in plasma ashers. SOLAR SIMULATION: Simultaneous solar simulation is available with 3 VUV & UV sources. IN-SITU ATOMIC OXYGEN DENSITY: Atomic oxygen density profile across sample can be measured by resonance absorption. Resonance Ltd. has developed a system to expose materials to thermal atomic oxygen and VUV-UV light that simulates low earth orbit conditions. Oxygen atoms are produced upstream from the exposure chamber by RF dissociation of O2. 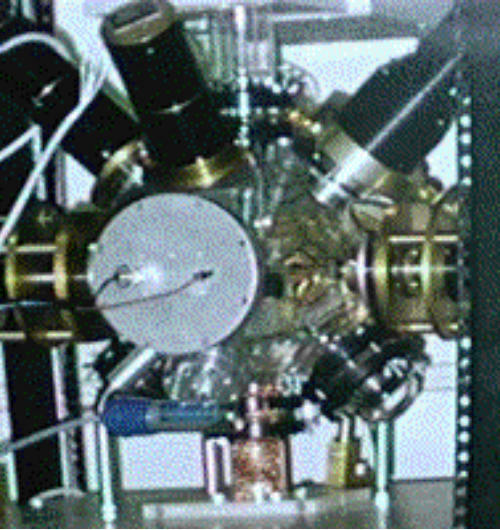 Atomic oxygen concentrations to 10^15 atoms/cm^3 can be generated with the high power RFX-500 generator. This is comparable to an atomic oxygen flux of roughly 2x10^16 cm^2/sec (equivalent 5 eV atomic flux measured with Kapton dosimeter). The oxygen density profile across the material sample can be measured in-situ with the Resonance Ltd. Atomic Oxygen Density Profiler using the technique of resonance absorption. 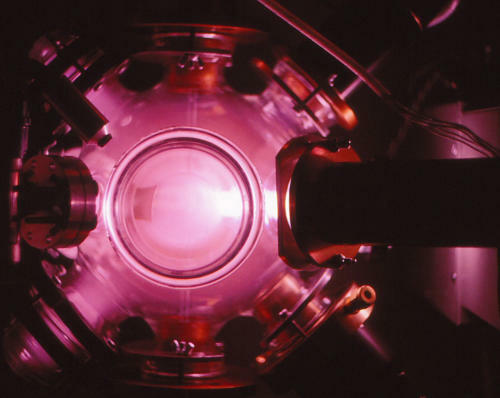 A beam of light from an atomic oxygen 130.2 nm resonance lamp is directed across the exposure chamber. This light is absorbed by the oxygen atoms in the chamber and the amount of absorption is measured by a VUV solar blind diode. 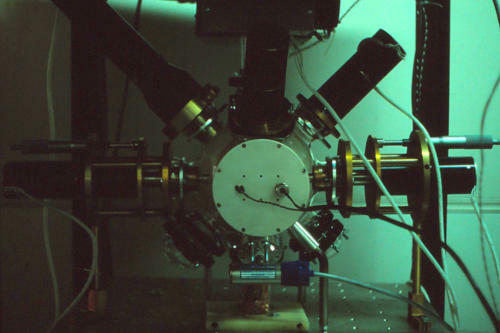 The density profile across the sample can be determined by scanning the optical path. Resonance can also provide UV and VUV sources that simulate the solar spectrum in order to evaluate the effects of exposure to UV and atomic oxygen simultaneously. The Atomic Oxygen Density Profiler and Solar Simulator Sources can be easily adapted to existing atomic oxygen exposure systems. Resonance offers three complete ATOMS systems to suit a variety of applications and budgets: The deluxe system (ATOMS-SX); the standard system (ATOMS-S); and the budget system (ATOMS-C). 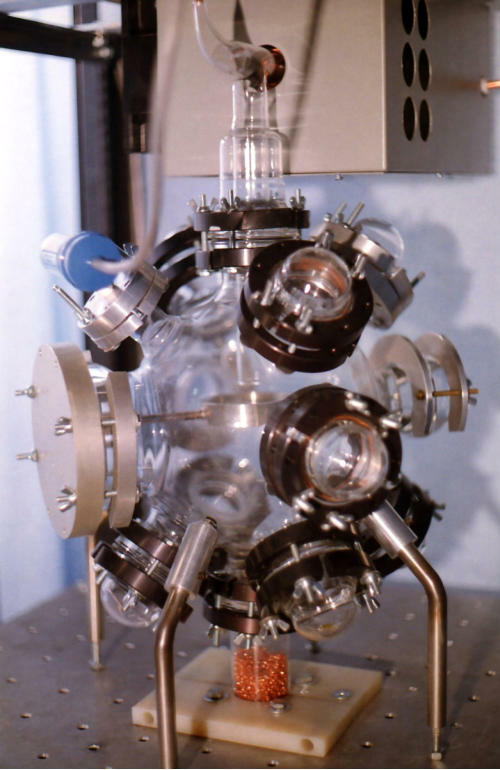 Both the ATOMS-SX and the ATOMS-S systems include exposure to atomic oxygen and VUV radiation, as well as in-situ atomic oxygen density measurement.